Geeta Hippie clothes. Geeta Bohemian clothing. Artsy clothing for expressive women! Since 1972 Geeta of India has lead the way in creating classic gypsy hippie chick bohemian shabby chic styles for women and juniors. Handmade boutique styles at affordable prices. 100% Rayon Jaipuri block print palazzo Pants with elastic waist and drawstring. 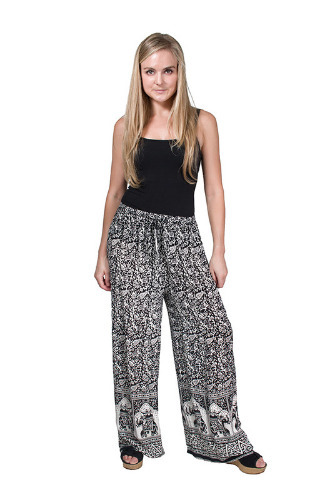 These pants are super comfortable and would work well for yoga, dancing or the beach. A great addition to any bohemian wardrobe. Very comfortable and versatile. These pants go with many GEETA tops. You can choose your main color but the Jaipuri patterns are all different and come assorted. Check the measurements below.